Workout Your Body — Not Your Fingers. REPS Pro has been built around rapid data entry. Its unique wheel-based design means that you never have to fumble with a keyboard when logging a set. Default values intelligently adapt to your workout so you only have to make small adjustments (if any at all). Easy to Learn. Fun to Use. Remember the delight of exploring your iPhone for the first time? Yeah, this is like that. Sliding grates, whirring wheels and chunky buttons will leave you fully immersed. It’s like an addictive game that motivates you to hit the gym just so you can play with it. Feel like winging it? Just pick an exercise and start working out. No planning required. REPS Pro will record it as a workout template so you can use it another day. Less time thinking, more time achieving. Create your workout plan before you hit the gym. Just add all your sets and assign a target reps/weight for each one. After logging a set, REPS Pro will even let you enter the targets for the next time you do that same set. No more watching the clock. Built-in rest timers tell you when it’s time for your next set. Review your progress or plan for the upcoming exercise — the time is yours. And they run in the background so you can fiddle with your playlist (or your hair). REPS Pro doesn’t have the rounded corners or glass buttons like other apps. Nor does it look like an outdated arcade game. It feels like a piece of equipment that belongs in the gym — just nagging you to take it there. Supersets are a workout technique where you do multiple exercises in a row without a rest. They can build muscle faster and can save time in the gym. 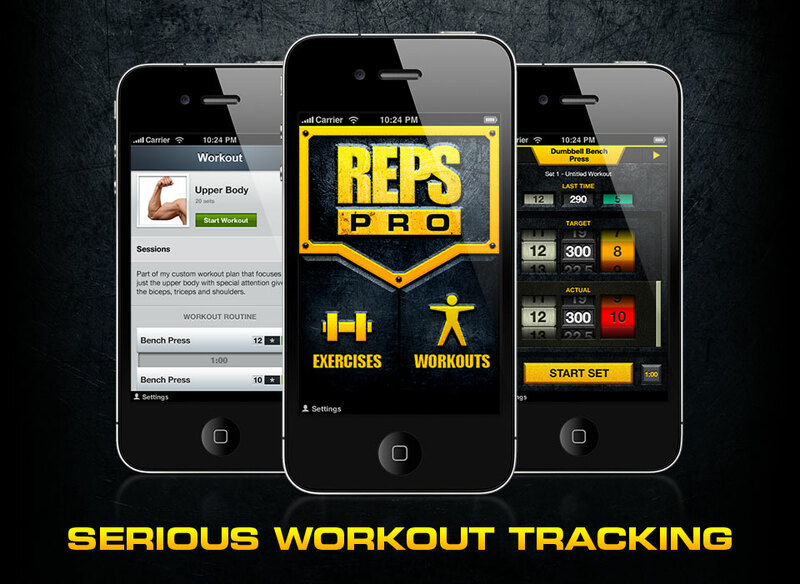 REPS Pro lets you take any exercise and easily superset it with another. Lift. Swipe. Lift. You just did a superset. Pre-loaded with an intentionally small amount of sample exercises for you to play with. Get the hang of it and then add your own workouts. Learn a new exercise from a magazine, video or even another app — it doesn’t matter — just enter it in and let REPS Pro do the tracking. who also prototyped all of the screen flows, UI and UX. Copyright © 2011-2019 Appstronomy. All Rights Reserved.